Lulynne Streeter is an award winning author, poet, journalist and editor. She is the 2015 recipient of the Christina Sergeyevna Prize at the Austin International Poetry Festival, a juried poet at the Houston Poetry Festival, and a 2006 Honorable Mention at the International Human Rights Contest. Publication credits include: Houston Chronicle, Albuquerque Journal, El Paso Times, New Mexico Magazine, New Mexico Business Journal, San Pedro River Review, Texas Poetry Calendar, Boundless and di-verse-city. 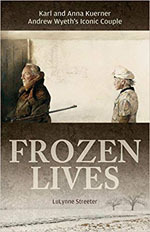 Her book Frozen Lives: Karl and Anna Kuerner, Andrew Wyeth’s Iconic Couple, published by Schiffer Publishing, came out in the fall of 2017. Streeter is also the author of Dry Borders, co-author of Johnny Be Good, and is the Publisher and Editor of Hollering Woman Press. 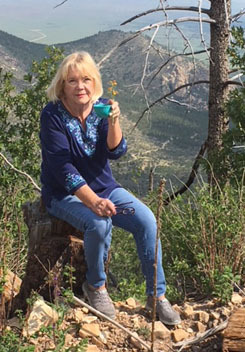 She is currently working on an anthology of short stories set in New Mexico titled The Valley of Peace. Streeter lives and works in Ruidoso, New Mexico. A hardened German soldier, a fragile mother teetering toward madness, small children adrift in hardship, and a dark landscape capture the imagination of the Kuerner family’s neighbor, a young artist named Andrew Wyeth. The boy begins to paint their lives, share their secrets, and forge bonds that last a lifetime, creating a startling and extraordinary immortality for them all.